Pillar to Post: SMILEY FACE ON MERCURY/ HOW DID THEY DO THAT? SEPARATED AT BIRTH--It looks like even the craters on Mercury have heard of Have a Happy Day Smiley Face!, says the scientists at NASA. The central peaks of this complex crater have formed in such a way that it resembles a smiling face. This image taken by the MESSENGER spacecraft is oriented so north is toward the bottom, says NASA. The MESSENGER spacecraft is the first ever to orbit the planet Mercury, and the spacecraft's seven scientific instruments and radio science investigation are unraveling the history and evolution of the Solar System's innermost planet. Visit the “Why Mercury?” section of NASA.org website to learn more about the key science questions that the MESSENGER mission is addressing. During the one-year primary mission, MESSENGER acquired 88,746 images and extensive other data sets (as of Fall, 2012). MESSENGER is now in a yearlong extended mission, during which plans call for the acquisition of more than 80,000 additional images to support MESSENGER's science goals. WHO ON EARTH CAME UP WITH THE SMILEY FACE? WORCESTER — Harvey R. Ball, whose simple drawing of a smiling face on a yellow background became a cultural icon, died Thursday after a short illness. He was 79. Ball, who co-owned an advertising and public relations firm in Worcester, designed the Smiley Face in 1963 to boost the morale of workers in two recently merged insurance companies. My brother Bernie and I have always been correctly credited with the creation of the smile fad that began in the early 70s as you have described. We have never claimed that we drew the yellow face design that is accepted today as the original — that was indeed done by the late Harvey Ball. We were the first to see the consumer appeal that this happy face possessed. We placed it on many different products, posters, shirts, greeting cards, mugs and dozens of other items. This has been documented in newspapers all over the USA in the early 70s. This was the era of Vietnam and the country was desperate for something warm and fuzzy. Just ask Forrest Gump. The only claim that N.G. Slater can make is that they were one of the many manufacturers that supplied us with buttons … millions of buttons. As to the phrase "Have A happy day," not until we placed these words together with the face on posters and other products did it become mainstream. In the 70s telephone operators ended all conversations with "have a happy day." The smiley face continues to bring joy to people all over the world. It is used today by Wal-Mart and other companies. Bernie appeared on the TV show "What's My Line" back in 1971. We did not as you have described make gazillions. We did create one of the most instantly recognized fads of the 20th century. Have a happy day. Sources: NASA.org and Cecil Adams. 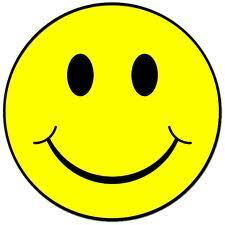 More info: Cecil Adams is an American blogger, who among gazillion other topics covers the Saga of Smiley Face. For a fun read catch his Smiley Face thread.